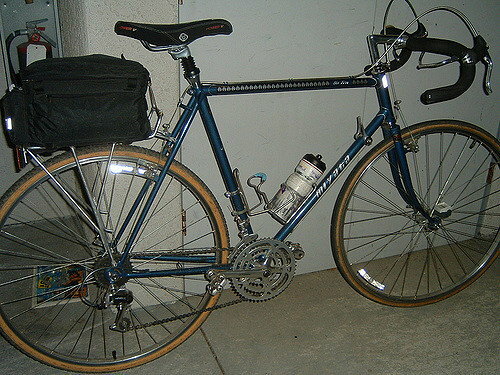 I've had a couple of Miyata tourers (Six-Ten and Gran-Touring) that I used mostly for off-road adventures. I retired the first one after doing years of singletrak mountain biking on it (eventually using an arc'd flat bar), only because I suspected it had taken near one too many downhill, rock-strewn fire roads. It held up to it all just fine, even as I had bailed off feet-first over the handlebars many times. I donated it to Trips For Kids when I found my Six-Ten and had resumed my off-road efforts on the new bike. I'm confident that Miyata made some of the toughest frames, but that's just my anecdotal contribution to the subject, my opinion. I added strips of finishing tape to cover the rows of blemishes to the top tube and prevent further damage, but I spared it not as I continued beating on the thing as my own skill set allowed. I nearly won a B-class CX event on it after riding the 15 miles to the event, but had the pictured cheap rear derailer come apart on the last lap after gapping the field. The memories are part of the bike's appeal at this point, it weighs quite a lot (sporting a downhill saddle, lol, and a suspension seatpost). I broke a couple of freewheel rear axles over the years, likely in part to the severe climbing while in the smallest chainring over mountain-rough terrain. I still have it, though I use my Trek 7500 hybrid with it's Bontrager SPA front suspension for most of my adventuring lately.